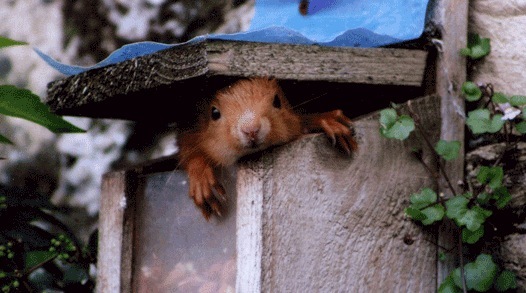 Many people are still lucky enough to have red squirrels visit their gardens. This provides an excellent opportunity to help encourage local populations of reds. There are several ways of doing this ranging from providing food, creating habitat features, to simply keeping us informed of the squirrels you see. It is important to remember that the food you provide for red squirrels should be supplementary, and not take the place of their natural food sources. Small amounts of food should be put out every 3-4 days. Hazelnuts in their shells are one of the best foods to provide, but other foods including wheat, linseed, or pine nuts are also useful. Fruits such as apples also make a welcome addition. Peanuts and sunflower seeds can be used but are of lower nutritional value. We do not recommend using peanuts exclusively. Evidence is starting to suggest that peanuts may cause liver damage in red squirrels as they can contain a substance called aflatoxin. If you do use peanuts, please make sure they are labelled as “Aflatoxin free”. A variety of food helps to relieve problems such as calcium deficiency which is particularly an issue for young squirrels. Providing bone meal, a cuttlefish bone, or even pieces of carrot can help protect against this. It is important not to overfeed, and all uneaten food must be removed from the feeder, not allowed to accumulate. There are many relatively inexpensive squirrel feeders on the market. If you would like to try your hand at making your own feeder, we can provide you with a template and instructions that follow an approved and tested design. Feeders and feeding sites should be located as high as possible, out of the way of cats. All feeders or feeding sites must be regularly cleaned with a disinfectant such as Virkon S or Trigene to help ensure good hygiene for squirrels, garden birds, and yourself. Be careful – providing too much food could result in artificially increasing the number of red squirrels that can be supported by the natural habitat in your area. This can lead to hardship if the supplementary food source is interrupted, for example by your summer holidays or if you move home. You can help local red squirrels get through hard times by feeding them when natural food sources are low. One of the most important times for supplementary feeding is during the summer months; in between the availability of shoots and buds in the spring, and cones, seeds, and berries in the autumn. Due to the threat of disease transmission, we advise that you should not carry out supplementary feeding if grey squirrels are close to where you live, and existing feeders should be removed if a grey is sighted. If your garden or feeding area is visited by a grey squirrel, please notify your local red squirrel group immediately. You may also see reds foraging in your garden for plant shoots, fungi, and insects. Why not create a wildlife corner in your garden? This could include planting a selection of the squirrel friendly shrubs, allowing grass and wild plants to establish and grow tall, creating hiding places and habitat features such as rocks, and providing some logs to decompose to encourage insects and fungi. This will also help to support other wildlife in your garden. Squirrelpox Virus is a major threat to red squirrels. An infected squirrel can be successfully treated if it is caught in time. During the first week of infection a squirrel will become lethargic and uncoordinated. As the virus develops, lesions, ulcers and swelling will appear around the squirrels eyes, ears, mouth and nose, and on its paws. If you see a squirrel with any of these symptoms, or suspect any other problem please contact us immediately. If the squirrel can be caught, it may be possible to treat this otherwise fatal virus. Simply letting us know how your squirrels are doing makes an excellent contribution to red squirrel conservation. Submit sightings directly at: www.swt.org.uk/wildlife/squirrelsightings If you regularly see red squirrels in the same spot, you need only update us every month or so. Please keep an eye out for grey squirrels too. If you see a grey, we would be very grateful if you could report it to us immediately. Regular sightings allow us to monitor red and grey populations across the region, and they contribute towards valuable research.